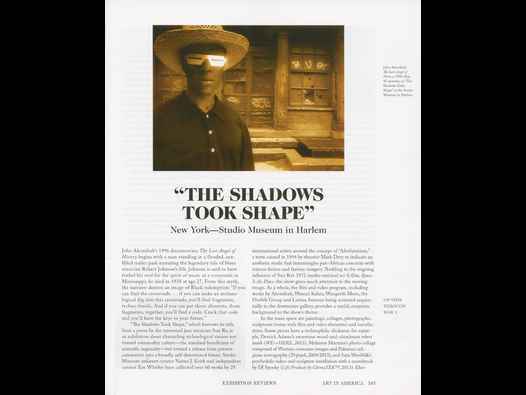 Feature in Art in America of March 2009, on Steve McQueen’s feature film Hunger. 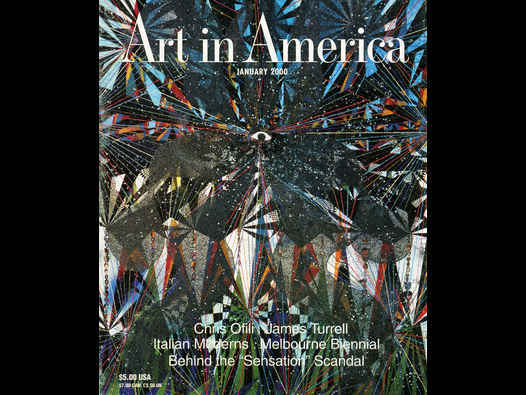 Lynn MacRitchie was responsible for a major magazine feature on Chris Ofili, published in the January 2000 issue of Art in America. Lynn MacRitchie, Ofili’s Glittering Icons: The intensely decorative paintings of Chris Ofili are informed by the vibrancy of black popular culture and the reality of British racism, aspects often overlooked in the controversy surrounding his work in “Sensation.” Art in America, pages 96 - 101. The text was extensively illustrated, including three full-page reproductions, one of which was Ofili’s celebrated No Woman No Cry, of 1998. For good measure, the cover of the magazine featured a full page detail of Ofili’s Third Eye Vision, 1999. This review of an exhibition by Yinka Shonibare MBE appeared in Art in America, June/July 2008, on page 189. Titled Yinka Shonibare at James Cohan, the exhibition in question was Prospero’s Monsters, held at James Cohan Gallery, New York, 17 April - 17 May 2008. The review was written by Faye Hirsch and came with a reproduction of Shonibare’s The Sleep of Reason Produces Monsters (America), 2008, C-print on aluminium, 72 by 49 1/2 inches, at James Cohan. A detail of the work was reproduced on the cover of the magazine. The review was illustrated by a still from John Akomfrah’s The Last Angel of History, 1996, the work with which Atkin began her review. 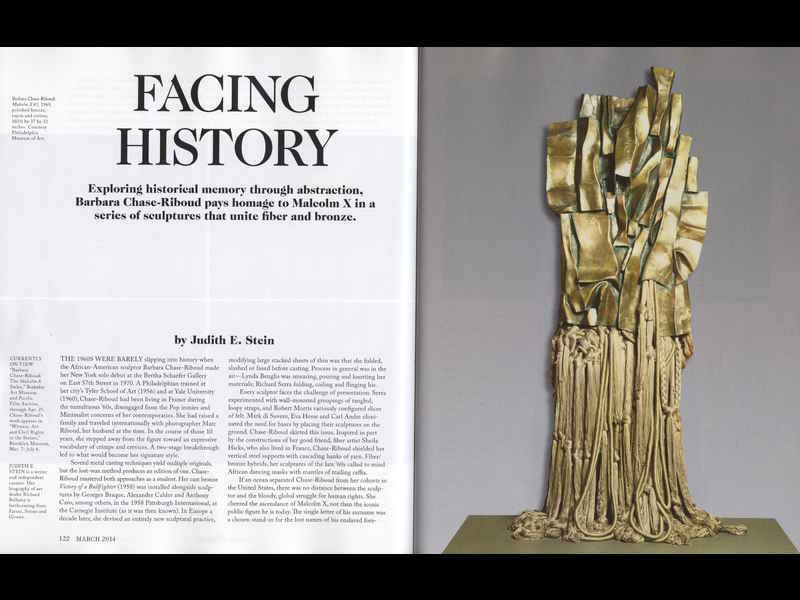 Substantial six-page review of Barbara Chase-Riboud: The Malcolm X Steles, exhibition at Philadelphia Museum of Art, September 14 2013 - January 20 2014, then Berkeley Art Museum, February 12, 2014 - April 27, 2014. 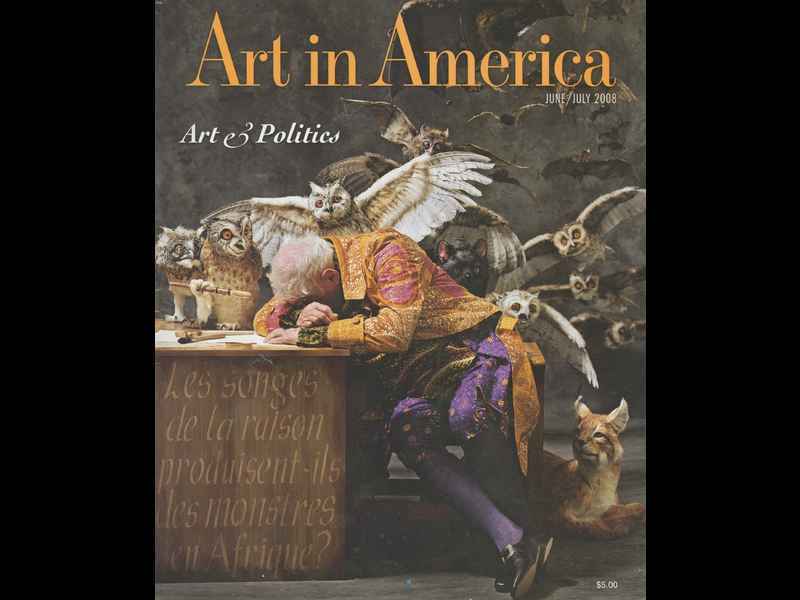 The review appeared in Art in America, March 2014, pages 122 - 127. 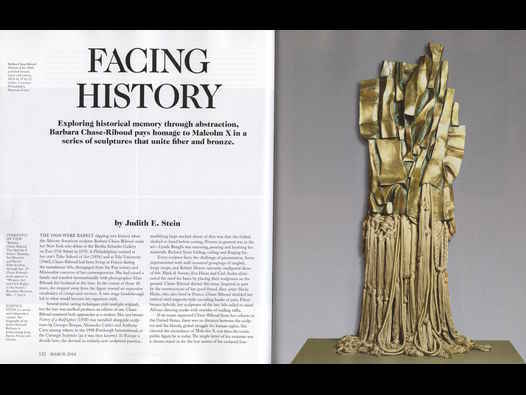 On the contents page of the issue, Facing History (written by Judith E. Stein) was trailed as “Juxtaposing disparate materials, Barbara Chase-Riboud’s abstract “Malcolm X” sculptures recall - and seek to transcend - the often bloody struggles of the Civil Rights era.” This was a significant and far-reaching appraisal of an intriguing artist.